The NorthCentral FSET program has connections to a wide variety of education and training opportunities. Education and Job Skills Training can help a person gain higher-wage positions and lead to a long-term career. To be eligible, a person must be a recipient of FoodShare and be enrolled in the FSET program. Training must be approved by the FSET case manager and incorporated into the person's Employment Plan before funding is available. Funding is limited, so not all training requests may be approved. We partner with other programs, including WIOA, DVR and W-2 to share costs for co-enrolled customers. This page provides information on a variety of education and training opportunities. If you are interested in a training that is not listed on this page, please be sure to talk to your case manager about the opportunity! 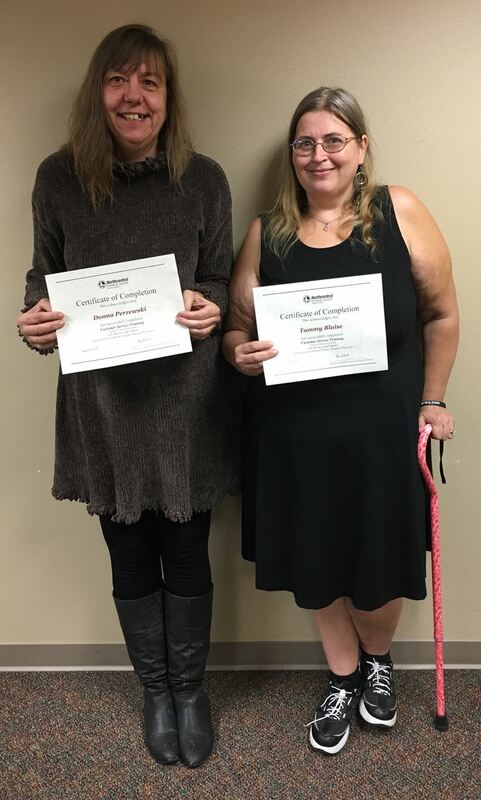 Donna recently completed the Customer Care course through Northcentral Technical College, which was funded through Northcentral FSET’s Job Skills Training Program. During this two week course, Donna reported that she further developed her communication, interpersonal relationship, trust building and accountability skills. She stated that she was able to learn how to view work situations from different perspectives, to find creative solutions in customer service. Donna also noted that she gained confidence from her past customer service experience; this assurance, along with the new skills and techniques she learned in the Customer Care course has prepared her for future success in this field. As a result of the attending this training, she obtained a new professional reference from the Professor who taught the course. Donna continues to work with FSET to find her ideal Customer Service job! Since Tammy enrolled in the FSET program, she has been very involved. She has been focused in completing her FSET activities and has embraced any opportunities to help further her employment search. When Tammy was told about the NTC Customer Care Training, she was interested right away. After completing the course, Tammy commented that it was very insightful, and she learned a lot about being an active listener and how to effectively communicate with others. Tammy interviewed for a new job shortly after completing the course and accepted an opportunity to work in a customer-service role with a local company. She will be able to use her newly acquired customer care knowledge in this new position. The NorthCentral FSET program is committed to helping you receive the education and training necessary to progress on your chosen career path. FSET can support education opportunities that are two years or less. If you are interested in a longer program, we can help refer you to a program that works with 4 year degree programs. If you want to pursue an education program that is eligible for federal financial aid, FSET cannot pay for the program tuition, but may be able to help with books, supplies or transportation cost. Is the training for an in-demand job? Have you demonstrated interest in this field for a career (evaluated through career assessments)? Are you able to get to the training? Does the FSET program have available funding? There are many career opportunities and pathways in the labor market. The best way to discover them is through a career assessment. Below are a variety of career assessments you can take for free! A High School Diploma or an equivalency diploma (GED or HSED) can help you get a good paying job or earning a workplace promotion. Our FSET program can connect you to local GED/HSED providers. FSET can pay for your GED/HSED tests and help with transportation costs to get to and from classes. PBS Literacy Link is a free online GED preparation program and is our go-to website for customers who want to study for the GED online. You can create a free account and begin using the online resources at any time. GED Live is a subscription-based, certified online GED preparation course. It provides both live and recorded classroom training to prepare you for the GED test. GED tests must still be taken at a local test center. This is a good option if you want classroom style support in preparing for the GED but you are not able to go to a local GED program. You must be enrolled in FSET and approved for this option to qualify for FSET funding. You can check out the Official GED information Page to learn more about the GED, study options and identify the testing center closest to you. The following are the most in-demand careers in our local labor market that require only a short-term job skills training program. CNAs are one of the fasting-growing employment sectors in our region. This is due in part because of the aging Baby Boomer population and because CNAs are now in demand at hospitals, clinics and many other health care areas. In response to the unmet demand for CNAs, the State of Wisconsin has implemented the WisCareers Caregiver program that provides FREE training and a $500 bonus for Wisconsin Residents if they complete the program and work in a qualifying nursing home for six months after training. All three Technical Colleges in our region (Mid-State, Northcentral and Nicolet) participate in this program. There is a significant shortage of commercial truck drivers. It is a career that offers high pay and good benefits. There are both over-the-road (overnight travel) and local positions available, although there is a higher demand for over-the-road drivers. Northcentral Technical College offers a CDL program, based at its Merrill campus location. It is a 10-credit, semester-long training program and provides a lot of behind-the-wheel driving experience. This program is perfect for a person who has never been behind the wheel of a tractor-trailer. To learn more about the program, click HERE. The NorthCentral Region has many employers who need trained welders. All three technical colleges offer short-term and degreed welding programs. FSET is able to help fund the short-term programs that are not eligible for financial aid. Adding a license or certificate to your resume increases your job opportunities. FSET can help you gain the following quick certifications. Many can be earned in just a few hours. Alcohol Server training is required to get your bartender license in Wisconsin and is often required for waiters/waitresses who serve alcoholic drinks. Alcohol Seller training is required for managers and cashiers who work at a business that sells alcohol (such as a grocery store or convenience store). Food Handler certification provides training on safe food handling practices that comply with Wisconsin law and regulations. Food Manager trainings provide more intensive training to help workers gain the knowledge and skills necessary to be a successful manager in the food service industry. The following online providers have been screened by FSET. Ask your case manager if you want to enroll in one or more of these courses. ServeSafe online training provides three key certifications. FSET can pay for these courses and the accompanying exam. There are several non-accredited online training opportunities that teach basic work and soft skills. It is important not to confuse these online trainings with accredited certifications, diplomas, or degrees from technical and 2-year/4-year colleges. The purpose of the training opportunities listed below is to increase your knowledge and vocabulary on a subject. Taking these classes may also help instill confidence in yourself when you're beginning a new career or create a spark of interest in further education or training. For more than a decade, the GCFLearnFree.org program has helped millions around the world learn the essential skills they need to live and work in the 21st century. From Microsoft Office, e-mail, reading, math, and more, GCFLearnFree.org offers more than 180 topics, including more than 2,000 lessons, 800+ videos, and 55+ interactives and games, completely free. GCFLearnFree offers 52 total subjects with the majority being computer and technology-related. Soft skills training also encompasses a large part of what GCFLearnFree offers. Options include training on Freelance Work, Adapting to Change, and Business Communication. GCFLearnFree even features an Online Education training that will teach you how to pursue online classes! When you pick an online class and decide to begin, you will find that each training consists of two things; a YouTube playlist and a PDF document that can be read online or printed. Between each 1-3 minute YouTube video, you will reference the corresponding PDF document. The combination of visual, auditory, and reading/writing learning approaches will prove to be a good fit for different learning styles! Alison has over 1,000 high quality online courses available across 9 distinct categories, all absolutely free to complete. All courses are self-paced and have been designed by subject matter experts to give you an interactive and enhanced learning experience. technology, language, science, health, humanities, business, math, marketing and lifestyle. Each course is either a diploma course or a certificate course. · Certificate courses (average time: 2-3 hours), which help you focus your learning to provide you with specific knowledge about a specific field or industry. · Diploma courses (average time: 8-10 hours), which are designed to give you a more extensive understanding of a subject area by helping you learn about multiple concepts within a subject. · Learning Paths (average time: 18-20 hours), which are a combination of niche courses that have been designed by experts to help you broaden your skillset and increase your knowledge of a subject. · You should create an account with your case manager. This will allow you and your case manager to accurately track your progress while making sure you receive credit for the hours you’re spending. · Because the classes are free, you can expect to encounter a 3-second ad each time you click through a screen during the course. The ad will ask you to upgrade to the Premium version to which you should decline. Keep in mind - if you are planning to utilize Alison consistently for many online learning opportunities, you can talk with your case manager about purchasing a Premium monthly subscription to eliminate the ads. · For many courses, there is a fee required to receive a formal printed certificate or credential after completing the class. Please talk to your case manager as they may be able to purchase this for you upon request. · Finally, you will need to be able to run Adobe Flash on the computer that you use for the trainings. Case managers can provide options for computer access if it is not readily accessible to you! JobSkillShare.org is an IT training provider composed of thousands of IT professionals in the field. There is a free membership level as well as various grades of paid memberships. This is an excellent resource for both new IT and experienced IT professionals. 360training.com provides over 6,000 courses. Some of these courses are as short as 4 hours and some are longer full-length training programs. The trainings offered on 360 Training are divided into 7 categories: Environmental Health & Safety, HR/Ethics & Compliance, Real Estate, Appraisal & Mortgage, Financial Services Education, Food & Beverage Programs, Industrial Skills and Career Training. 360 Training also offers specific trainings in ISO and OSHA, which would be a wise choice for someone who is interested in getting into manufacturing for the first time or for someone who is looking for a refresher. Most of these courses require a fee. Our FSET program can fund many of the short skills courses, but generally will not fund the lengthy courses due to funding limits. Individual courses can be combined for certificate programs. Talk to your case manager for more information! Be sure to talk with your case manager if you’re unsure about which training is the best choice for your employment and training goals! Your case manager will assist you with picking out a training, purchasing the course, and enrolling in the course. Microsoft Office Levels 1-3 At your own pace! Internal Control & Fraud Detection At your own pace! As identified in the In-Demand section above, there are a number of online training providers that offer required training courses to serve alcohol, sell alcohol and provide food safety training. Below are links to the main pages for three of those providers. 360 Training also offers the Alcohol Server certification for the state of WI, so be sure to speak with your case manager about which one will be the best choice for you! The NorthCentral Region has three Technical Colleges. Each offers a variety of short-term and degreed programs designed to move people into high-demand careers in the local labor market. Our FSET program works closely with all three schools to connect FSET customers to programs that match their career interests and goals. We have identified the most common courses below. Click the hyperlinks below to see details or a full listing of programs offered at each college. If you are interested in a program not listed below, please talk to your case manager about that program! Check back here soon for an updated list of Fall courses! An apprenticeship is an “earn while you learn” program providing on-the-job training and related classroom instruction where the employer and other instructors teach the skills of the specific occupation. The classroom instruction is usually taught at an area technical college while the on-the-job portion occurs at the employer’s location. The term of training may vary from 2-5 years depending upon which occupation you are interested in. Click the hyperlink below to review a full list of apprenticeship opportunities! Or, reach a local Bureau of Apprenticeship Standards (BAS) representative at 715-261-8754 for further information.